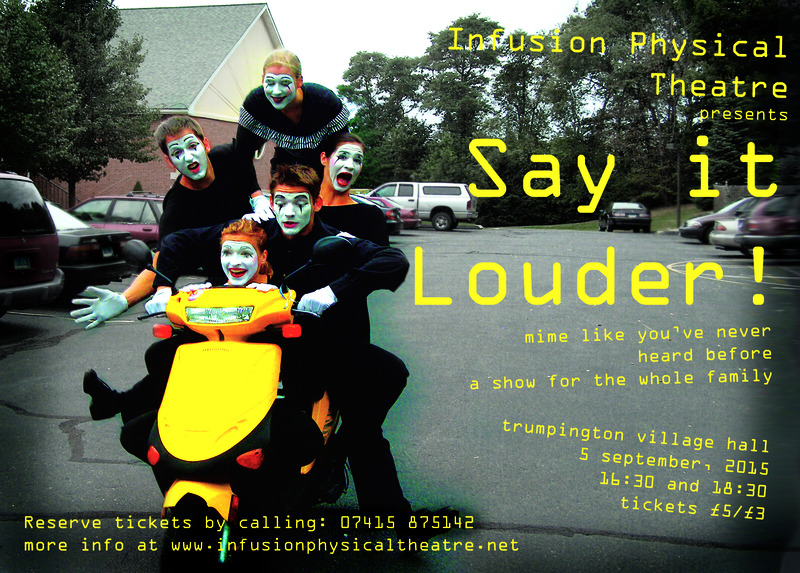 Infusion Physical Theatre is pleased to announce our Back-From-School-Holiday community show. Held at the Trumpington Village Hall, in the expanding village on the south side of Cambridge, its a show that’s enjoyable for kids and adults, at prices that can’t be beat! The 1 hour show is a collection of mime vignettes (short stories) compiled by the contributing artists from Wales and the Netherlands, (Rachel Smart and Mighty Impulse Movement) as well as Cambridge residents Dan and Melanie Cossette. It will be an evening of antics and laughter and great stories. The show will begin at 16:30 and repeat at 18:30. Call to reserve your place. See you there!